Sometimes it feels strange to share personal information here where I also share my musical interests, but ultimately, this is my little space o' internet and it reflects me on any given day. Today my heart is full, and I feel the need to share something personal. 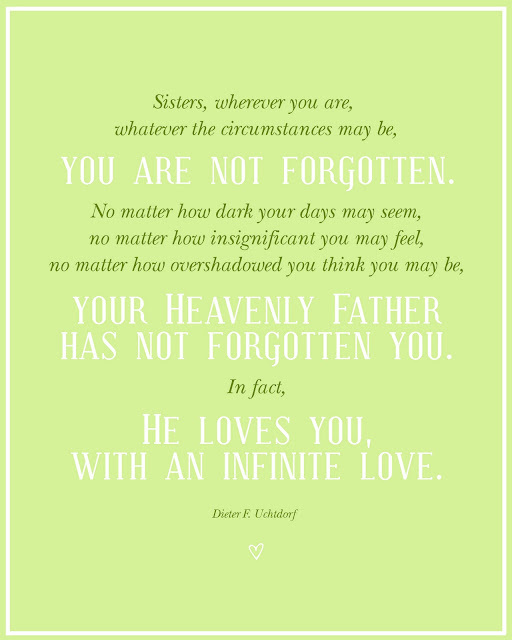 I know that I am a child of God, a daughter of a Heavenly Father who loves me. I feel His infinite love, especially on a day like today where my aching heart has been comforted and prayers have been answered. I've had some minor struggles these past few days, nothing earth shattering or life altering, but issues weighing on my heart. It's just typical life struggles; stress, responsibilities, feeling stretched too thin, parenting issues, feeling unsure of how to handle a situation, etc. Like I said, nothing earth shattering, but more of an overwhelmed feeling in my heart. Yesterday was one of those days where I just wanted it to end. It was a doozy. But, I said a prayer to my Heavenly Father while driving to town, essentially to escape for just an hour and to think and ponder. Almost instantly, I began to feel more at peace, I began to receive ideas and thoughts that helped me figure out a difficult situation. Honestly, I didn't really recognize these little tender mercies until later last night after the evening was winding down, and even more so this morning I can see His hand in lightening my burdens. A difficult situation still lies before me, all of the many responsibilities and commitments I have still exist, but today, I feel peace and unconditional love from my Father in Heaven. I cannot deny that He is there, ready to assist me when I will submit to Him. This experience has reminded me that I must rely on Him, I must ask for His help. And He will help me. He knows me. He loves me with an infinite love that I cannot even comprehend. And He loves you too.